It’s 8:30 AM and I’m standing in Place de Québec waiting for a driver to arrive to take me on a full-day Battlebus tour of “American Highlights.” Like the Hotel Churchill, this too I reserved long ago in anticipation of the crowds that come to Normandy each year to mark the anniversary of D-Day. I was lucky enough to snag a place in their final group of the week. After this, they’ll be closed for several days to allow their guides to join in the events. I had been promised a small tour on a minivan with no more than eight people, so as I wait in the cool morning air, I’m surprised to see a gaggle nearly double that in size. When two vans pull up in the square, it becomes clear that the company has added a second to satisfy the demand for tickets. There is a French driver, but just one guide, a cheerful Brit named Dale Booth, who is quick to explain that he will drive as well, and rotate between vans from one stop to another to give everyone a chance to ask questions. I would be disappointed in this ad hoc arrangement, and even a bit upset, if I wasn’t so immediately impressed by Dale’s knowledge and enthusiasm. From the start, I trust him completely. He begins by laying out the day’s itinerary. The swell of visitors to the region has complicated things, so too have the preparations for President Obama’s visit to the American cemetery in Coleville later this week. To avoid the madding crowds and the U.S. Secret Service, Dale suggests doing the day’s typical itinerary in reverse. We will stop at the cemetery early in the day—the one made famous in the opening and closing scenes of the movie “Saving Private Ryan.” Then, we’ll head to Omaha Beach and Pointe du Hoc, break for lunch, and continue on to Utah Beach and Saint-Mere-Eglise. The first stop, however, is along a quiet country road, where Dale takes a moment to explain the bocage terrain in Normandy and the enormous obstacles its hedgerows imposed on Allied troops. 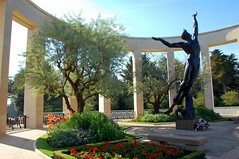 When we arrive at the American cemetery at 10:00 AM it is, as Dale had hoped, quiet and serene, nearly devoid of visitors, save for a group from Luxembourg who have come to lay a wreath at the foot of the bronze statue in the colonnade, and a company of U.S. soldiers in army fatigues. 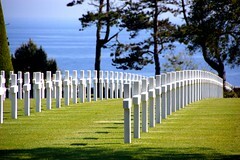 We have 45 minutes here and I spend the time slowly, starting at the memorial, then walking along the path overlooking Omaha Beach, down through the pines to the chapel and back, along a neatly trimmed lawn with rows of white crosses that arch toward to the sea. I have several uncles who served in World War II, but none who crossed the English Channel that day to land on the beaches below. Still, I find myself moved to tears by the beauty of the place and the horror that it comforts. In my hand, I hold a map showing the location of some of the more famous graves—Theodore Roosevelt, Jr., the son of a president, and the Niland brothers, whose deaths a day apart inspired the movie “Saving Private Ryan”—but try as I might I notice the uniformity of the stones more than the names, and I am struck by the overwhelming sense of anonymity it creates. Not the kind that is disrespectful of sacrifice, but rather the kind that elevates grief and attributes it to a common cause. Before we go, I look out at the tents and metal bleachers being constructed for the week’s events. The reflecting pool has been covered to create a makeshift stage on which President Obama, Britain’s Prince Charles and Prime Minister Gordon Brown, Canadian Prime Minister Stephen Harper, and French President Nicholas Sarkozy, will stand just days from now. There will be journalists and camera crews and military bands, and every year a dwindling number of veterans will come, until one day soon they will come no more. I’m not sorry to miss the speeches, for I would rather walk in silence among the ghosts. Back in the van, we’ve got a half hour drive down to Omaha Beach and we pass the time by getting to know one another. I’m riding with a friendly family of five. Tammy and Steve are from Atlanta and they’re nearing the end of a trip with their three teenage children: Julia, Taylor, and Tucker. Tucker makes us all laugh when he decides that Dale’s accent makes him sound a lot like Austin Powers, which is, to a ten year old, a very cool thing. Dale takes the compliment in stride, although he’s clearly more intent on getting us all to rent the “Band of Brothers” DVDs. There are no acceptable excuses. We really must fix whatever is wrong with our lives to make time to see it. Standing on Omaha Beach, Dale takes out his walking stick and draws diagrams into the sand to help us understand just how difficult the terrain was for the troops who landed there in June 1944. He points up to the remains of German defenses, known as Widerstand Nests, and tells us how they were able to provide a line of cross-cutting fire into the masses below. And he explains why so few wounded were able to survive the initial assault on the beaches—they either drowned as the tide came in, or were killed by soldiers in the bunkers above. 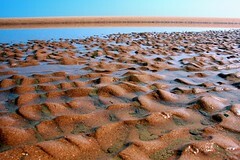 It’s a beautiful beach, and it’s hard today to imagine the tide pools filled red with blood. A World War II airplane circles overhead, and behind us a group of re-enactors in Army fatigues stand at attention by their jeeps and raise their arms to their foreheads in salute. The past is everywhere. But I also look to the left and see a woman walking her dog along the edge of the water. There is a concrete pier in the distance and the people on it may well be enjoying a view of the English Channel on a fine summer’s day as much as remembering D-Day. Dale says that this is what the French tend to do. They respect history and honor it, often in touching ways—especially in Normandy—but they live with it, rather than apart. Omaha Beach is still a beach. 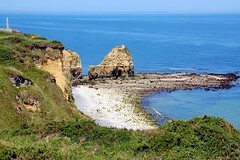 We head west and visit Pointe-du-Hoc next, where Army Rangers once scaled the cliffs using rope ladders. The landscape is scarred deeply here. There are craters, the remains of German bunkers, gun emplacements, and rusted barbed wire. We break for lunch at a local B&B, and then head off to Utah Beach and Sainte-Mère-Église, where a parachute and mannequin hang from the steeple of the church in honor of Private John Steele and the 82nd Airborne, recording an incident made famous in the movie “The Longest Day” (1962). 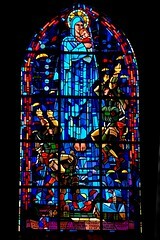 Inside, a stained glass window depicts the Virgin Mary in blue, holding the baby Jesus, with paratroopers on either side descending into the village below, as if sent from Heaven itself. Before we leave, we have some free time at the airborne museum across the street and Tucker is pleased when I spot a uniform with his name on the breast pocket. Our final stop of the day is a visit to a tiny 12th century church in the town of Angoville-au-Plain. Dale wants to show us the monument outside that honors the work of Robert E. Wright and Kenneth J. Moore, who served as medics in the 101st Airborne Division. During the Normandy campaign the men used the church as a hospital and the pews for beds. They toiled for more than seventy-two straight hours to care for soldier and civilian casualties. 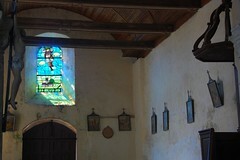 Inside, as in Sainte-Mère-Église, a stained glass window commemorates their efforts. As Dale explains, some of these memorials are donated by philanthropists and veterans groups, but most are paid for and maintained by local survivors and their descendents in small towns all across Normandy in recognition of the American sacrifice here. Later, back in Bayeux, I linger over a pleasant dinner at La Fringale. I’m dining on boeuf bourguignon tonight, but it’s the fried potatoes on my plate that have me thinking. I’m reminded of the silliness following September 11th, where in a pique of anti-French sentiment, French fries were for a time renamed “Freedom Fries” on the menu of the U.S. Capitol cafeteria, and I am ashamed for those who accuse the French of being ungrateful.